I’m linking up with Billy from Coffee Addicted Writer for another Book Blogger Hop. This week’s question comes from Marie @ Night’s Dream of Books. Honestly, I’m past the age where scaring myself is fun. I’ve become quite skittish in my old age. But urban fantasy? Yes, please. My introduction to urban fantasy was Shadowshaper by Daniel Jose Older. While I haven’t gone down the rabbit hole and read everything I could get my hands on, I do quite enjoy magic in the city. A bit on horror, though. The kind of horror I like is not what one traditionally thinks of when conversations about horror roll around. My kind of horror is the kind where the story is set in the near future, and there’s catastrophe. 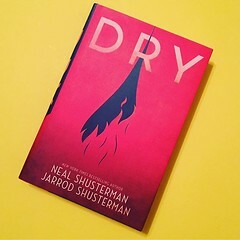 Kind of like what I’m reading right now, Dry by Neal and Jarrod Shusterman, about what happens when clean water runs out. It’s terrifying because I live in the desert, and it’s terrifying because the north could dam the Rio Grande, and then were would we be? Real life scary as hell. Which would you pick? Horror? or Urban fantasy? I prefer reading horror novels over urban fantasy, though I do like supernatural/paranormal romances.